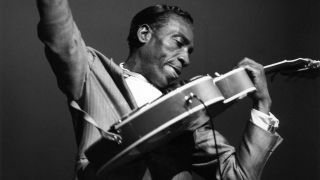 As one of the first guitarists to play blues on the electric guitar, the great T-Bone Walker would influence legends such as BB King, Chuck Berry, Jimi Hendrix (who emulated his trick of playing with his teeth) and many others. It’s probably fair to say that anyone who has ever played blues on the electric guitar has been (directly or not) influenced by him. This month’s examples are styled after two of Walker’s famous recordings. Firstly, the classic Stormy Monday inspired a slow 12/8 blues, giving lots of space for expressive, loose phrasing. By this, we mean feel free to play ahead of or behind the beat - it sounds much more effective than metronomically perfect timing. You’ll be surprised just how ‘out of time’ you can push or pull these licks, though take care not to lose your place in the chord progression! The last two examples are inspired by Hey Baby - a more uptempo shuffle in 4/4. There is still room for experimentation, but the faster tempo and shuffle beat dictate a more concise style of phrasing. T-Bone usually plugged a Gibson semi-acoustic into a Fender Twin turned up extremely loud, but any guitar with a hint of overdrive and a bright tone should work. It really is all in the fingers! For more blues playing advice, check out our revitalising 12-bar blues tips and 8 essential blues guitar lead tricks. Though the tab may look complicated at first glance, don’t be discouraged. At this tempo, semiquavers are not too fast and the timing is down to your own feel. Read through the tab slowly and feel free to put your own stamp on the phrasing. The rakes across the strings are an easy, fun way to add the odd flourish! Taking a more controlled approach, the triplets and four-note grouping in bar 2 require more precise playing. Take note of details like the fast, shallow vibrato and quarter-tone bends; we’re playing these inflections on the minor 3rd - a common blues trick. Bar 2 sounds a little jazzy but in fact follows a simple pattern of notes. Stepping outside the usual pentatonic scale shapes that you probably know, this phrase sounds almost like a horn line based around a D7#9 chord. It's played in a deliberately unusual ‘spiky’, angular way that contrasts with the smoother pentatonic phrases in bars 3 and 4. Changing tack to a swung 4/4 feel, this example features the sliding doublestops that have become such a mainstay in electric blues - listen to Stevie Ray Vaughan’s Pride And Joy for example. Bar 3 showcases a little of the interplay between major and minor sounds that are such a hallmark too. T-Bone was very fond of the 9th chord shape seen here played with triplet rhythms in bar 1. Notice how we’re using the chord melodically, so that the top note outlines a move from D9 to E9, going via an Eb9 passing chord. It’s a simple trick that you can use in many 12-bar blues turnarounds.